Projapoti Mon Lyrics from Chaalbaaz. 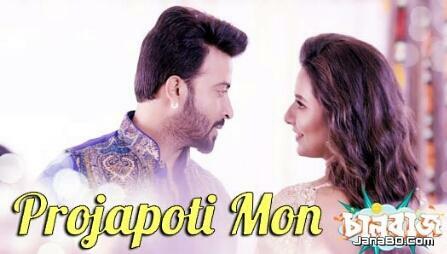 Starring: Shakib Khan and Subhasree Ganguly. The Song Is Sung by Madhushree Bhattacharya. Music composed by Savvy Gupta. Directed by Joydeep Mukherjee. Search Feeds: New Exclusive Song Projapoti Mon Lyrics From Chaalbaaz, Chaalbaaz Movie Song Lyrics, Projapoti Mon Lyrics By Madhushree Bhattacharya, New Song Projapoti Mon Lyrics, Indian Bangla Song Lyrics Projapoti Mon Featuring Shakib Khan & Subhashree Ganguly.